Tomorrow’s South Shropshire Journal announces the long expected end of the current town bus services in Ludlow. It is a headline that will create huge anxiety for regular bus users around the town. Ludlow’s buses are a shambles and a disgrace. The service is unreliable, inaccessible and uncomfortable. And it looks as though it could get worse with the operator R&B announcing that it will withdraw all services in Ludlow town on 25 January. The South Shropshire Journal and the Shropshire Star report what passengers have been hearing for some time – the current town bus operator R&B is to walk away from the service from 25 January. Shropshire Council has confirmed that a bus service will operate regardless of whether R&B continues to run the route. But with just days to go before the current service ends, the council has not provided any details. Income from on-street parking is put towards providing the Park and Ride bus services in [Ludlow], with any surplus used to subsidise local bus services. This doesn’t happen. The council raises £113,000 a year from on-street parking charges in Ludlow. Where does that money go? It certainly doesn’t go towards providing Ludlow with the decent bus service its residents and visitors need. The 1985 Transport Act tells councils they must ensure that bus services meet “the convenience of the public in using all available public passenger transport services.” It instructs them to pay special attention to people who are elderly or disabled. These rules apply to all bus services, whether they are subsidised by the council or not. There is nothing convenient, especially for the elderly and the disabled, about Ludlow’s clapped out bus service. There is every possibility that we will end up with even worse services after 25 January, unless Shropshire Council agrees to subsidise Ludlow’s bus services. Shropshire Council will spend £2,257,405 subsidising buses across the county in 2013/14. 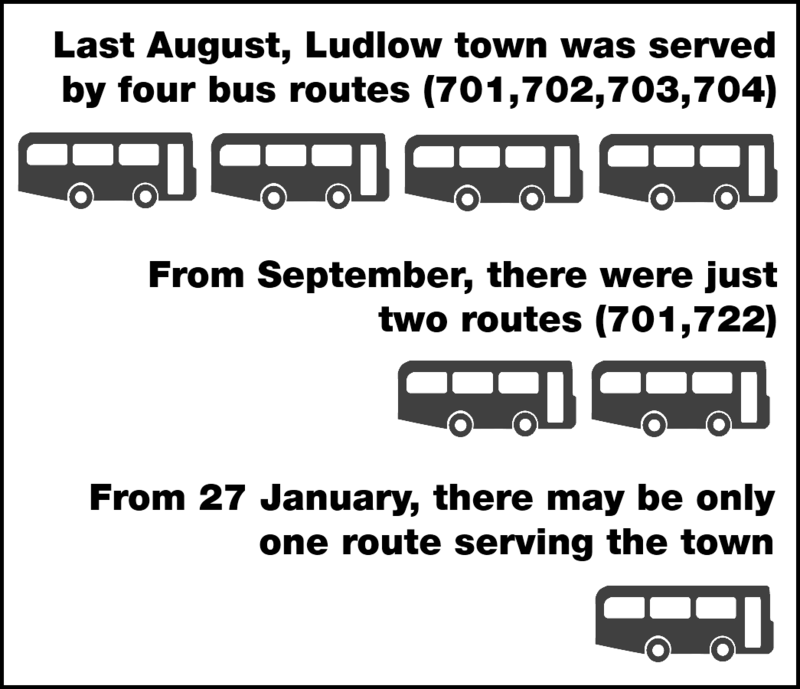 Ludlow is the only town that does not to receive any subsidies for its town buses from the council. The town is not getting a fair deal. Shropshire Council has made a complete shambles of bus services in Ludlow. I have spoken to many people in the last two weeks who are worried sick that there will be no buses after the 25th. They rely on these bus services. But all we hear from Shropshire Council is silence. That’s not good enough. This mess is nothing to do with budget cuts and everything to do with incompetent management of bus services by Shropshire Council. The people of Ludlow deserve better. I will continue to fight for a fair deal on buses for our town.